Here is an example of Moilanen arc with not even a hint of Parry or tangent arc. However, unlike in the previous post photo, there might be a suggestion of parhelia here. If there occurs a display where Moilanen arc is present with halos from purely random orientation only, one might easily distinguish from the crystal sample the crystals that would orient and make Moilanen arc. The photo was taken by Marko Mikkilä on 15 January 2009 in Sievi. What about the self made halos, any luck with the M-arc yet ? Yes, Moilanen arc has appeared in the diamond dusts created with the Mikkilä crystal gun. Moilanen arc originates from human made nuclei sources. Doesn't matter if it is snow gun or your own ice crystal gun that makes the crystals. Interesting, any crystal samples? 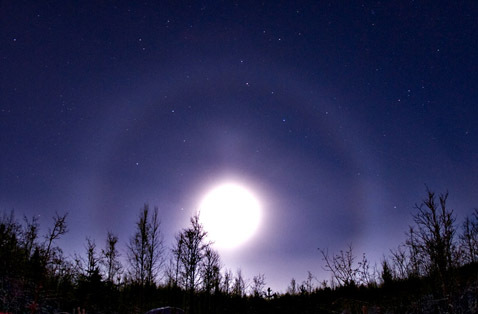 I know diamond dust season has started in Finland and big super halos yet? Can't wait to make some halos with my paint gun this winter. Somehow to my eyes this photo is an extremely fascinating photo. The simplicity of the phenomenon is really deceptive, hiding the great M-arc mystery. The halos together with a very nice looking starry sky and foreground constitute a fine photo.